A virtual reality learning module for Google Cardboard to teach high school students about the role of elastic tissue and smooth muscle in arteries to control blood pressure. An animation for potential grant committees, oncologists, and patients to explain an innovative neurosurgical technique. 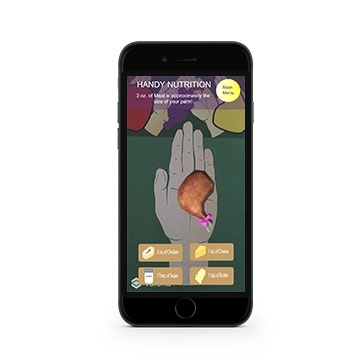 An augmented reality application developed to teach the public about portion sizes based on their own hand. A medical compliance application for Android Tablet created for physicians to help remind and monitor the wellness of epilepsy patients in low Internet accessible areas of Ecuador. An artistic scientist with a strong focus in the scientific method. Due to Adriana’s experience as an art researcher, cognitive psychology research assistant, and her master’s degree in Biomedical Visualization from the University of Illinois at Chicago, she brings her skills and expertise in research, planning, and designing to create impactful experiences for users within the mobile, virtual and augmented reality fields. Her creativity matched with her ability to logically deconstruct health problems through research, make her an excellent user experience and user interface designer and researcher. She will provide effective and efficient solutions to your visual challenges to create an easy to use application that will be intuitive to your consumers. The Life Cycle of A LadyBug. This poster was created to teach the general public about the ladybug and their various developmental stages. The poster was created using a combination of the 3D program Pixologic ZBrush and Photoshop. HIV Binding To A T-Cell. This still image represents the binding of HIV to a T-cell. To create this image, 3ds Max in combination with After Effects was used. Van Der Waals Forces In the Gecko Foot. This 3D modeled poster was created to teach high school science students about a chemical phenomenon such as van der waals forces. 3ds Max, Autodesk Mudbox, and Photoshop were used. FFAR4 and Type 2 Diabetes. This is an informative molecular poster that focuses on a portion of the mechanism behind chronic tissue inflammation. Chronic tissue inflammation is a key mechanism underlying insulin resistance which is a key factor in the development of Type 2 Diabetes. This poster was created using the Visual Molecular Dynamics (VMD), After Effects, and Photoshop. Adriana earned her BA in Biology with a focus in Neuroscience and Spanish from Carleton College. After graduating, she spent two years working in advertising/marketing and art research in downtown Chicago and as a Cognitive Psychology Research Assistant in Dr. Ohlsson’s Deep Learning Lab at the University of Illinois at Chicago (UIC). During her time at UIC, she discovered the Biomedical Visualization (BVIS) Graduate Program that would combine her interests in science, technology, and the arts for the next two years. Adriana is interested in user interface and user experience design and research within the healthcare field. She’s fascinated by how seamless experiences can influence behavioral changes in both the short and long term. Adriana strongly believes in understanding and applying current scientific research to inform decisions in the design process when creating these applications for users. After graduating from her master’s program in May 2017, Adriana continues to pursue her passion for educating physicians and staff in the healthcare field through the development of intuitive experiences for virtual reality. For all other questions, please fill out the form below. I look forward to working with you!